Arthritis means inflammation within a joint. Many pets are affected by arthritis- up to 30% of adult dogs and cats! Any joint of the body can be affected by arthritis- most commonly, the hips, knees, elbows, and spine. Arthritis can be caused by: age related "wear-and-tear" or secondary to joint trauma or congenital problems such as hip dysplasia. Early symptoms of arthritis may be subtle such as: "slowing down", stiffness when rising, decreased stamina, avoidance of stairs, and hesitancy to jump. As arthritis progresses other signs can appear like: mild to severe lameness, lethargy, lack of interest in playing or being social with other pets or people, lack of normal grooming or litterbox habits in cats. Be aware that crying out is uncommon unless joint disease is severe! Don't wait for your pet to be so painful that they are crying before you seek help! 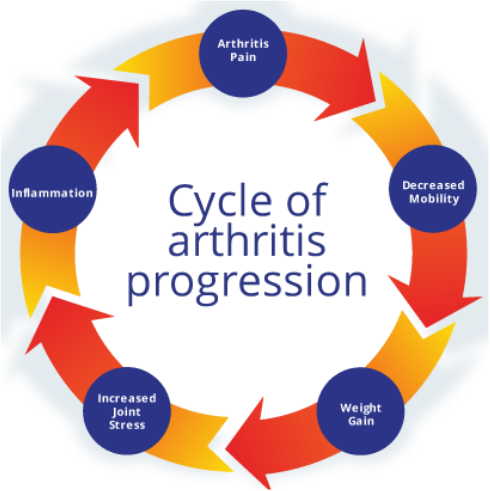 Arthritis is a chronic and progressive problem! Early intervention is key! Great information regarding arthritis is available by searching the www.pethealthnetwork.com database. Get off the Arthritis Merry-Go-Round!! All too often we see arthritis become a very ugly cycle of joint pain which leads to decreased mobility in the pet. This decrease in activity leads to fast weight gain which adds to joint stress and inflammation, leading to more joint pain......and the cycle goes on and on. You can help your pet at several points in this cycle. Probably the easiest and most effective place to start is by decreasing your pet's weight if they are overweight- this often means cutting back on calories since your arthritic pet will likely not be able to exercise as much due to joint pain. Ask your veterinarian for a specific weight goal and if a special weight loss diet may be recommended. Our weight scale is always available during regular clinic hours if you want to stop by to weigh your pet and check your progress! Talk to your veterinarian about specific ways to decrease joint inflammation and make your pet's joints more comfortable! Don't forget about arthritis signs in cats! Be aware that cats CAN NOT take many of the arthritis medications labeled for dogs and humans- please do not give your cat any arthritis / pain medication without talking to your veterinarian first!